It’s been a very long time since we had rain. So today when I went out on my trails, everything looked different. The first different thing I found was my girlfriend Lucy. The rain must have brought her out, because I haven’t seen her in a very long time. There’s nothing for you to take pictures of that you would be interested in looking at in that direction. There have been no flowers on my trails for awhile now. 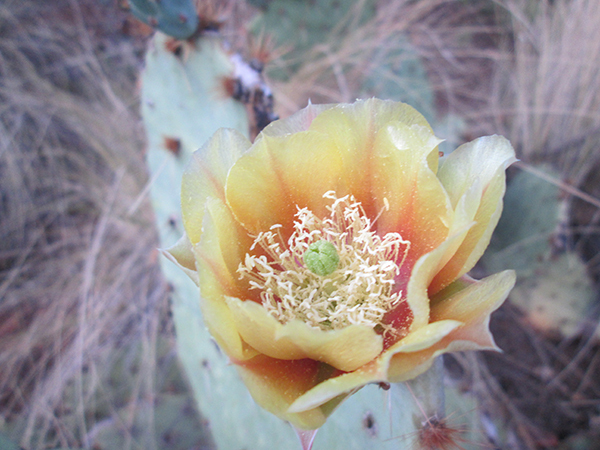 But a late blooming prickly pear popped out after the rain and of course my person had to take a picture. 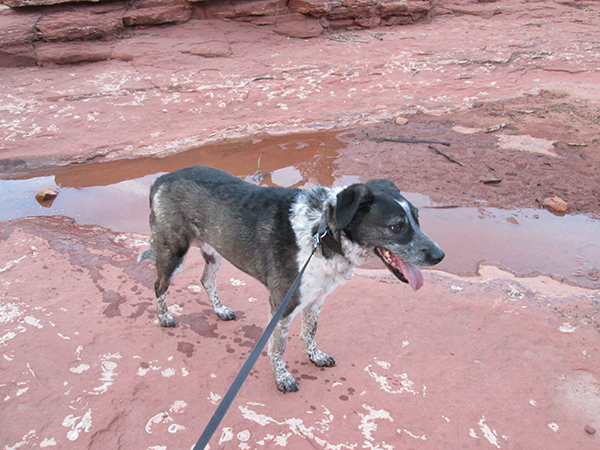 At least there were only two blossoms on all of my trails so I got my person moving along fairly quickly. And then I saw it!!! It’s been so long since I’ve seen my puddle that I almost forgot about it. But my person said we couldn’t stay forever – it was getting dark. So we saw a few ho hum things on our way back from my puddle. 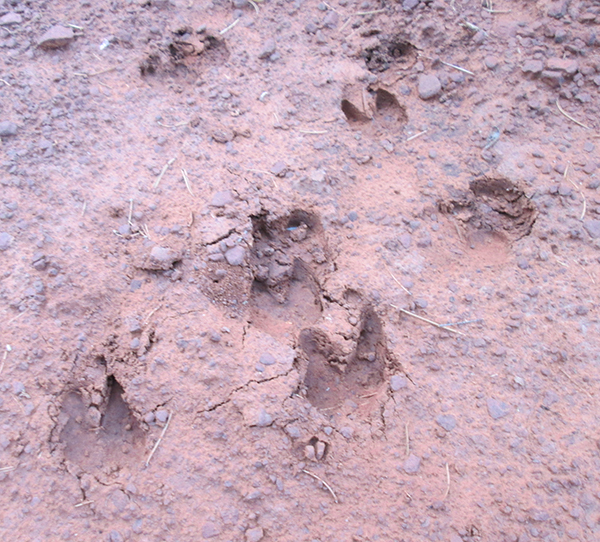 Javelina tracks in the mud. Fredrieka, I agree. Our people should only take pictures of us. P.S. I hope you didn’t get upset about my girlfriend Lucy. She only fills in the gap when I can’t see you. I didn’t play with her very long. You badly needed the rain so it is good that it came at last. before I even read your post I knew that you were going to say you had found your puddle. Can, t spell sycic so I shall say I have a mind that can know things. keep an eye on that puddle in case it disappears as it well might because the ground is so dry. Patrecia, you would fit right in here because we have lots of people in Sedona who claim they are psychic. I don’t think they know when my puddle is going to appear though. Marina, I think that’s it. My person makes the boring stuff look good. Now, if she only took pictures of me she’d have it easy. She doesn’t have to work to make me look good – just give me a few treats and I’ll do anything. Puddles are the most fun! I agree Dog or Nothing. Anything with water in it is fine by me. Little Binky, do you want to play in my puddle with me? Puddles! Absence does make the heart grow fonder. Karen, I hope I don’t have to mark my puddle absent again for a long time. Gah! Those tracks and clouds are not boring at all, B. The tracks gave me the shivers. The clouds gave Mom the shivers. Both for very different reasons…. Cupcake, at least it’s only the tracks. 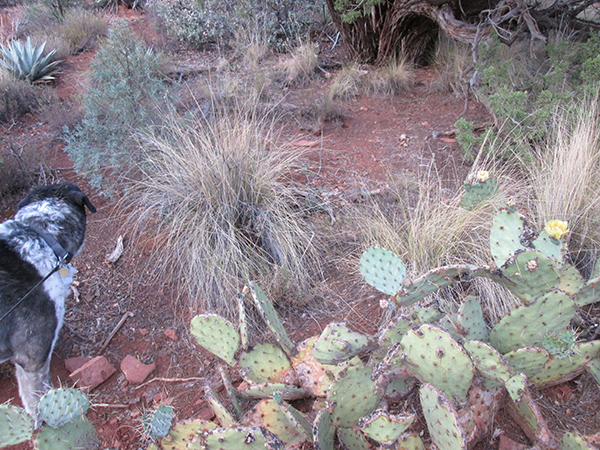 Most of the time those javelina hide out during the day and only come out at night. I’ve only seen one on my trails once. Lily & Edward, I wouldn’t mind the rain so much if it didn’t hang out with the thunder. That’s what I want to go away. I can’t even remember what rain and puddles are like, it’s been so long, and I don’t think they’ll be back until around november! Snoopy, we haven’t had any for way long either, but our monsoon season just started and by the start of it, it looks like it’s going to be a wild and crazy one. Marty, we’re getting lots of it now. I just wish the thunder didn’t come along with it. I agree with that Bongo! Good to hear you got some rain. And you got your puddle back! Patricia, I’m so happy my puddle is back. But now I’m afraid to go out to it. There’s thunder out there! Sometime we gotta take the bad to get the good. Nice to see your puddle is back!! Dalton, I’m glad my puddle is back too. I still can’t figure out where it keeps going. Maybe it has a vacation? I wish I could take as long of vacations as my puddle does. Or maybe not. I’d miss my trails too much. The humans always enjoy looking at the flowers and clouds. 😉 I am so glad you guys got some much-needed rain. 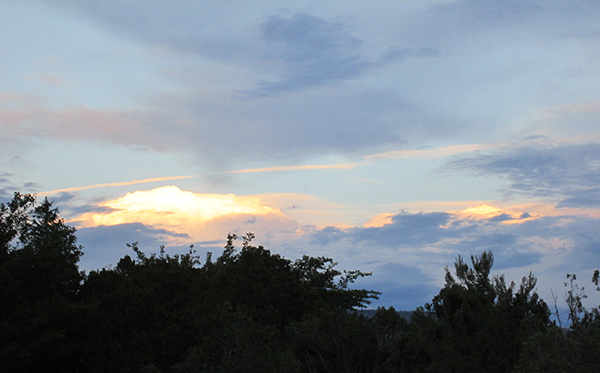 Rama, the rain is great – but I still can’t see what people like so much about flowers and clouds. Kevin, I think my person should save all her picture taking for me and my puddle. Mica, now that we have rain they’re worried about the creek near here flooding because of the fire we recently had. The creek’s not close to my house though. I hope yours gets some more water. Ginger, it’s only because you’re so far away. You know you’re my one true love.